I saw these words by May Sarton on Facebook yesterday, and keep going back to them. I know what she’s saying. And they struck me particularly hard because they appeared on the heels of an acute awareness of the lack of dreamtime in my days. My thoughts how I haven’t recovered the rhythms of my life or creativity, yet. That no matter how much I tell myself stick to The List, tasks get added like an army ants on the page. Small things that add up, fill the cracks and crevices in the hours. And squeeze me. I know the importance of ‘meandering’ days, called ’empty’ by May Sarton. I talk about them in my book, The Writer’s Block Myth. The value of pauses and breaks. I list daydreaming and engaging with our imaginations as one of the seven important things all writers do. This goes deeper, tho. It hits the heart of who I am. I’m never bored when alone. My imagination runs deep and layered. A psychic once said it had its own aura. Something she’d never seen before. Truth. . .I can sit & look out a window or into the distance for hours, experiencing with my heart and mind something beyond myself. And for me, it’s not unlike when I’m writing and into the work. Useful. If you saw me, you’d think me doing nothing ‘useful’ (an over-rated word). Consider and imagine what you see when you watch the light. The subtleties of color, shadows, negative spaces. Where that takes you. Or notice tiny details. How dust motes move, reveal the air. How leaves and berries weave, form texture. How the sun feels on each part of your skin. For me, it’s hearing with my inner self, considering the patterns of my life, ideas, and traveling places known & unknown. Stretching who I am so I’m bigger and part of a larger Universe. True for those who don’t write, too. For anyone, actually. There’s been too few of these sorts of days for me the past 18 months. The time I lie still in bed after waking that used to be filled with dreams, fun things to look forward to, or the scene I’m writing is now filled with thoughts of what’s got to be done, how to do it and when. A devil on my shoulder co-opts my dreams, constantly chatters To-Do’s, Shoulds, Oughtas. It just won’t sit in the corner and shut-up when I tell it to. My sense of happy peace, creativity, and writing is dangerously affected. You know know what I mean, right? I gotta shift this. I desire balance and grace. To wake up with I love my life on my mind. I won’t call finding that sweet spot of relaxation, where peace & creativity dance a challenge. That alone sounds like work and makes my heart hurt. Perhaps a bit of radical self-care scheduled for more than an hour or two. And crossing an entire day off on my calendar as a BE zone. Sticking to it, something I’ve not done in a long time. And traveling, which always takes me out of my routine, and brings me back home brighter, fresher, inspired. If that doesn’t work, I’ll pay closer attention. Listen & watch for the answers to my questions. They always arrive when I’m open. After all, it’s mostly a head thing. The intention’s set. Failures of the past irrelevant. Now it’s time to give myself permission. Something else I write about in my book. It’s clear the doctor needs her own medicine. The harvest full moon seems a good time to start. Tell me. . .what takes you out of your mind-chatter and feels like Peace? Like what you read? Sign up for updates in your inbox. Are you a Fierce Hearted Writer? Learn more, click here. 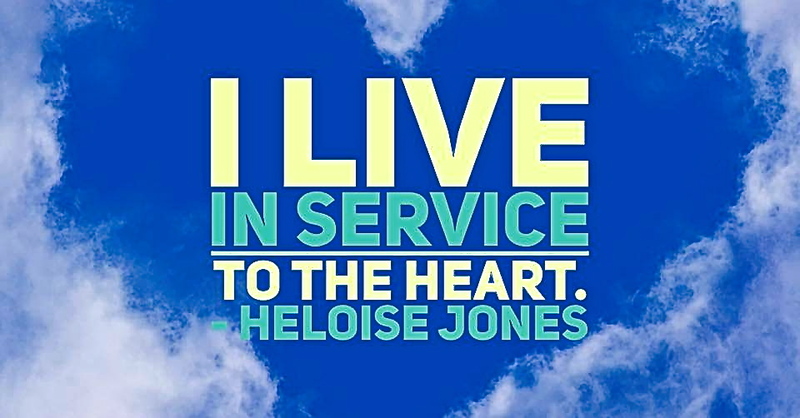 This entry was posted in life, spirit, writing by Heloise Jones. Bookmark the permalink. I have changed my routine. I make coffee in the morning, and instead of going to my writing, I’ve been lighting a candle and meditating, with coffee! No one told me I could do that. I just decided – and you know what? I’ve noticed the writing going better for it. And the day. I love this, Nancy! Meditating with coffee (! ), doing it *your* way, and best, giving yourself permission to. Changing it up, and the discovery that comes with it. Fabulous. Thanks for sharing this. Send my FREE Creative Life Guide. Put me first for news & posts. A Guide to Get Past Stuck & Experience Lasting Creative Freedom. © 2019 HeloiseJones.com - All rights reserved.